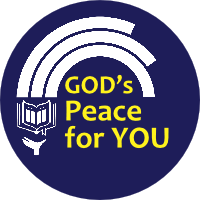 Walsall Christadelphians – "The LORD bless you and keep you; the LORD make his face to shine upon you and be gracious to you; the LORD lift up his countenance upon you and give you peace." "The LORD bless you and keep you; the LORD make his face to shine upon you and be gracious to you; the LORD lift up his countenance upon you and give you peace." The Bible presents a hope of a life beyond our current mortal experience, a life after death. But do we merely endure our lives now in order to be transported to something better after death? We aim to show you that the power of this hope lies in its ability to change our lives now. I am the resurrection and the life. The one who believes in me will live even if he dies, and the one who lives and believes in me will never die. We offer you a warm welcome to join us for our presentation on the theme “How to Have a Relationship with God”. We’d love to see you there. Any questions, drop us a line. 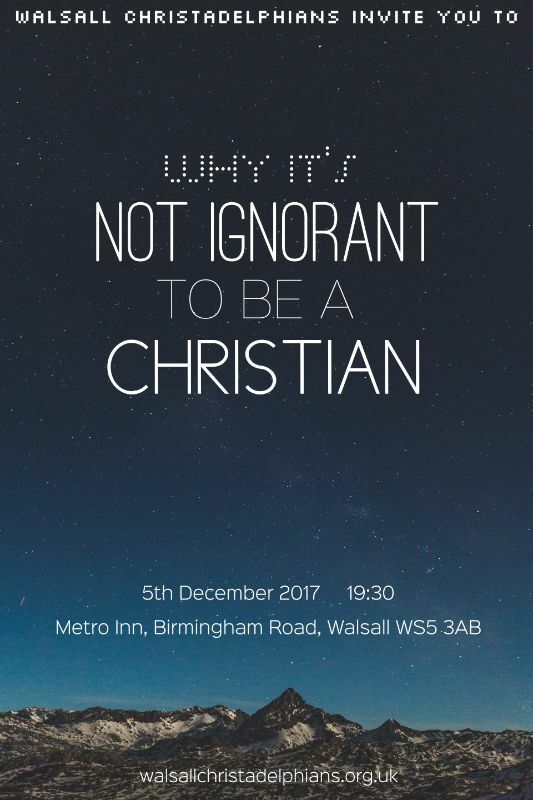 We warmly invite you to our presentation “Why It’s Not Ignorant to be a Christian”. Tomorrow we are continuing our studies in Mark’s gospel looking at chapters 2 and 3. Jesus’ healing work is a theme of these chapters. He cures a paralysed man and another who had a withered hand. In fact, having “healed many” (3 v 10) he seeks refuge in a boat on the lake from the crowds who are crushing around. Only three chapters into Mark’s record news of Jesus’ miraculous ability to heal is spreading and he is attracting large crowds wherever he goes. Why did Jesus heal people and how did he have the power to do it? Do Jesus and the gospel still have the power to heal and save today? 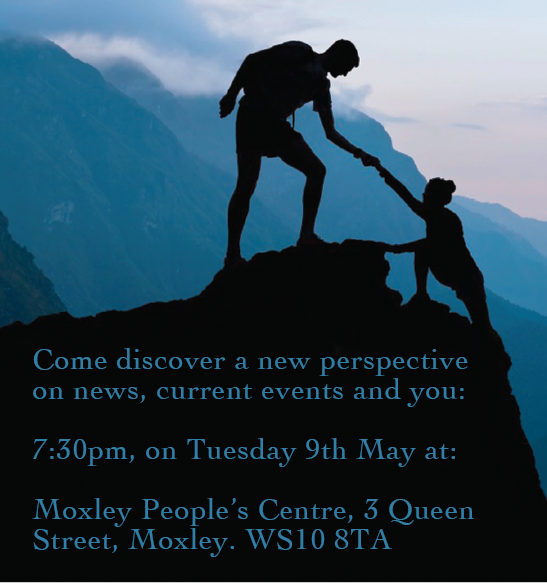 Come along and learn with us. Get in touch via email or Facebook if you have any questions. We started a new series at our Bible Hour* this morning: The Gospel of Mark. As the shortest of the four gospels in the New Testament it is often considered the perfect book to introduce us to Jesus of Nazareth and the things he did and taught. Mark sets a lively pace from the start and presents Jesus as immediately going to do this or going there straight away. This morning was no exception and within the opening verses of Mark 1 we were introduced to John the Baptist. Great crowds have gathered from Jerusalem and all over the south of the country (v5) and are watching from the river banks or waiting to be baptised in the water by John. Jesus joins the crowds and eventually (see Luke 3 v 21) steps into the water himself. John is initially reluctant to baptise Jesus (Matthew 3 v 14) but Jesus explains that “it is fitting for us to fulfil all righteousness.” (Matthew 3 v 15 – ESV). Get in touch or pay us a visit if you want to learn more about baptism, what it is and why Jesus considered it important. *Sundays, 10:30am – all our welcome to join us. We are living in uncertain times, but the Bible can give us reassurance and confidence for our lives. We’d love to invite you to our next free public talk to explain why. No booking required, but please get in touch if you have any questions. 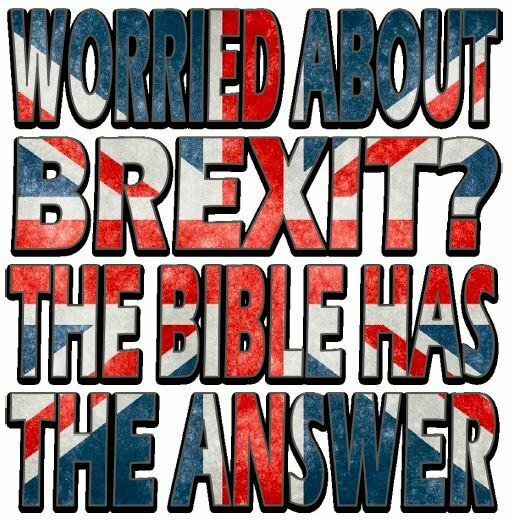 Are you worried about Brexit? Anxious about the consequences of the UK’s decision to leave the European Union? 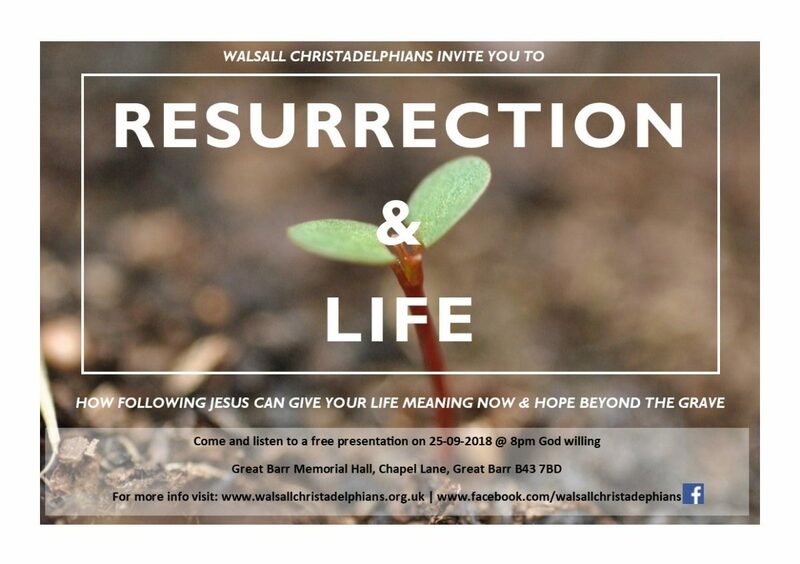 Walsall Christadelphians are hosting a free public talk on the subject on Tuesday, 29th November at 7:30pm. Please note that on Sunday 11th September we will not be meeting at our usual venue but at the home of John and Sally. 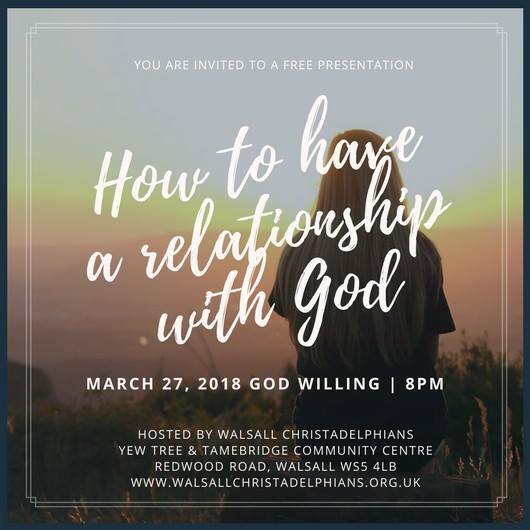 Please email (info@walsallchristadelphians.org.uk) or call (0121 530 0621) if you would like to attend and want some more information. As many of our members are away, there will be no meeting on Sunday, 19th June. The Christadelphians in Stafford and Cannock are jointly hosting a series of events this Easter under the theme “Peace 4 All”. Bible study in members' homes. Please contact for the venue.